K-Bar RV Resort in Show Low, AZ. has 90 RV spaces which are nestled in among tall pine and oak trees. Each RV space has full 50 amp and 30 amp hook-ups. The interior roads are gravel paved. Each space has off-street parking. 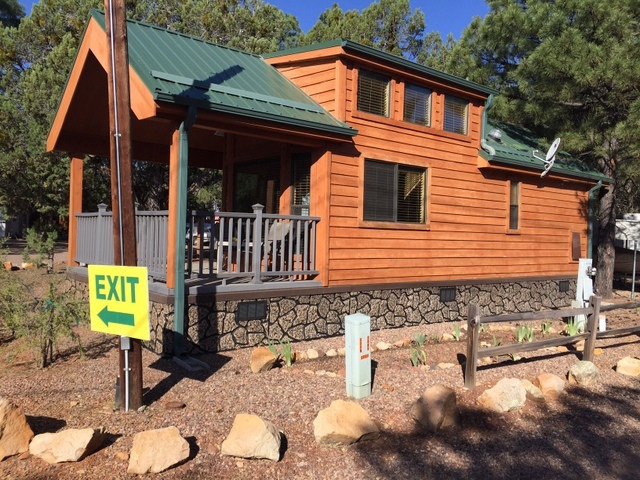 The park rests on approximately 10 acres and offers a 2415 square foot clubhouse with WiFi access, handicapped & group facilities, cable TV, pet section, telephone hookups, restrooms and showers. The park offers many planned activities including Bingo, live entertainment and pot lucks. The monthly and annual residents are sub-metered for electricity. The park pays the water, sewer and trash, the residents pay for metered electric, cable and propane.